Children and untrained singers usually do not have vibrato in their voice. It is often found when they have been singing for a while. 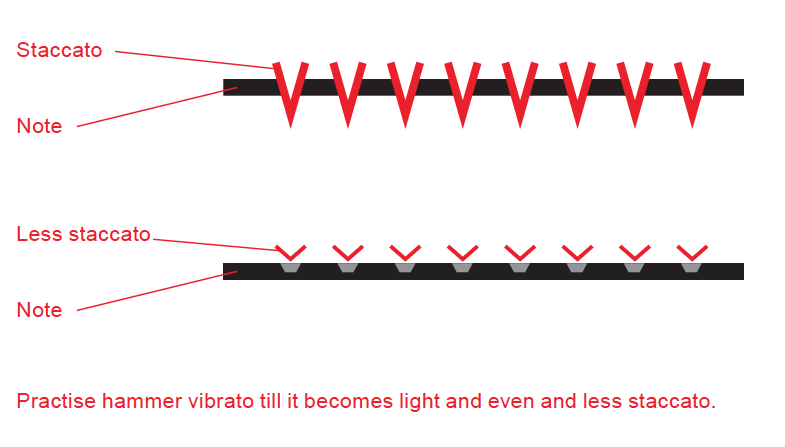 After having acquired a vibrato it usually requires a good deal of technique to be able to sing without. Very skilled and experienced singers often chose to alternate singing with and without vibrato depending on musical style. The speed and range of the vibrato can vary greatly from singer to singer. There are two types of vibrato: ‘hammer’ and ‘laryngeal’ vibrato. Hammer vibrato is particularly characterised by pulsation, whereas laryngeal vibrato is characterised by both pulsation and difference in pitch. Both vibratos may be acquired through practice. Hammer vibrato is also known as ‘vocal cord’ vibrato. It sounds like a long sequence of pulsations on the same note. It may be thought of as a long line of attacks. Hammer vibrato is most likely produced at the vocal cord level, i.e. Level 1 (see ’Various levels of the vocal tract’). If hammer vibrato is used in Overdrive or Edge it may sound like a bleating sheep or a machine gun. The Vibrato may be trained to reach the desired speed of pulsations. It is often heard in ethnic musics such as Arab singing and flamenco singing. It is also used by some French singers like Edith Piaf and Charles Aznavour and by several folk singers. The second type of vibrato is laryngeal vibrato or ‘throat’ vibrato. The difference between notes in this vibrato may be more or less distinct. Laryngeal vibrato is achieved by moving the larynx up and down creating a variation in pitch. This vibrato is most likely produced in a combination of levels from 1-4. The vocal cords produce the pitch and the hypopharynx produces the speed (see ’Various levels of the vocal tract’). It is possible to control the pitch and the speed of the vibrato. Skilled singers use vibrato to emphasise expression. Both types of vibrato can be used in a song. Many singers adjust the speed of the vibrato to the rhythmic subdivisions of the song. For example, many singers choose to put a slow vibrato in a slow song and a fast vibrato in a fast song. A frequently used method to emphasise intensity is to start on a note without a vibrato and then gradually add it towards the end. Different musical styles have different individual preferences as regards the types of vibrato used. Classical singers often sing with a larger vibrato than rock singers. Rock singers hardly ever start a note with vibrato, whereas classical singers almost always use vibrato from the beginning of the note. Most singers have a tendency to add more vibrato as they get older, unless they are aware of the issue and take precautionary measures.